My niece, Kaily, lost her first tooth today. My dad pulled it out. It was quite exciting. It's been loose for weeks now, and she finally let Grandpa string it up and jerk it out. Since the tooth fairy is visiting her pillow tonight, I wanted to maker her something special to house her first tooth. 1. Cut a piece of wool felt to approximately 2" x 5" and a tooth shape out of white wool felt for the front. I freehanded mine, but you can trace the outline of a shape like this. You can search google images for one you like. 2. Sew the tooth to the 2" x 5" strip. Stick close to the edge of the tooth as you stitch it on. 3. 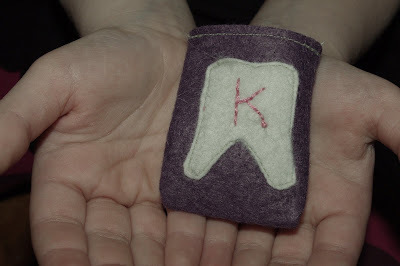 I put a "K" on the tooth with pink embroiddery floss using a basic back stitch. 4. Fold the 2" x 5" strip in half, right sides together. Sew down the sides and turn right-side out. Very easy. Sorry I didn't take step-by-step pictures of this one. It was a spur-of-the-moment job. If you want to make this and have questions, please don't hesitate to email me. I'd be happy to help you! I hope you guys aren't getting sick of wool felt. I can't help it, I have a craft crush on the stuff. I need a sewing machine so I can make all these fun things! I blogged about you and the swimming suit today. Thought you might like to know . . . Have a happy day! Where do you get your wool felt in such beautiful colors? The fabric stores around here don't have any fun colors at all. Try a quilting store. I get mine from the Gathering Place in Rupert, Idaho! Funny, your blog reminds me of my experimental days with wool. I also tried to pull out my tooth with wool but I ended up meeting my Greenville, SC dentist. I never thought it was too dangerous, the blood won't stop and my tooth is still attached to my gums. I should have read your blog first before I did it. LOL. Dentists (Greenville, SC) in the neighborhood was so concern of me that time, they all went to the house to give me something cold and those lollipops that makes the teeth stronger.